Hey. This is Jesse. I don’t know who checks this blog, but today I put together a 35 minute sequence of demos. Half of it is old MAR songs that haven’t been recorded, the other half is new material that I’ve been writing for the past year. So I guess I got pretty excited listening through them. Most of this stuff falls further into pop territory than before, with a majority of the tunes clocking in under 4 minutes; even a couple 2 minute jams. I’m still working out arrangements on the one longer track, and gonna re-write the melody/lyrics for an older MAR song that we never quite figured out how to play live (and have it sound good). That’s my hair in the upper left corner. 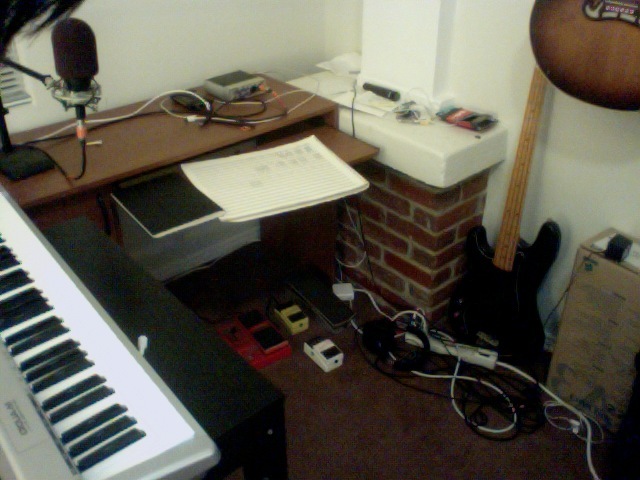 This is where I’ve been recording my demos. Not the most exciting picture I know, but pictures help. Meanwhile, back on the East Coast, Justin hasn’t had access to a piano in like, a year. We have one sitting in storage, but his new apartment isn’t big enough to host it. That’s it for now. Sorry I don’t have anything else to show, but I’m going to try to get these songs recorded as soon as I can.